Adrenaline junkies worldwide turn to this California company to ensure that a day they spent cutting the trail and feeling the thrill of launching from a jump isn’t their last. It’s impossible to go wrong with one, but with so many options, how can you choose? Thinking of skimping on your mountain bike helmet to save a few bucks? Don’t. Sure, massive Big Bore vents, advanced ratchet retention systems, sturdy EPS foam, and futuristic moisture retention systems that would make the entire agricultural industry green with envy have driven the price up a tad, but it’s worth it. We’ve scoured the Amazon marketplace for Fox’s top models. We considered dozens, and only a few have lived to tell the tale. We’ve taken comfort, protection, price, and style into account (it’s hard to look bad mountain biking, but looking great never hurts). We focused solely on standard helmets. If you want full face, you’re out of luck. Protection: Nothing is as important as the foam liner that sits between your heads and the ground. Fit: Your ride is only as enjoyable as your lid. Foam padding, adjustable heights, Y-strap systems—you name it, we considered it. Ventilation: Finding the right balance between keeping your head cool and keeping it safe is a delicate task. These models are the “coolest”. Literally. Convenience: Protection and fit are foremost, but a little extra convenience never hurt either. What Could Be Better: The visor is a bit of a challenge as it can come unclipped at times. 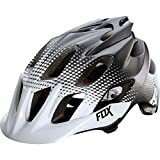 Fox’s Flux MTB Helmet nabs the top spot on our list for multiple reasons. This stylish, sturdy, and highly affordable model punches well above its weight (literally). It’s lightweight, has extra deep protection on your head’s most vulnerable points, and has extra perks normally seen on models double the price. 20 Big Bore vents for sweeping cool air across your forehead when you’re blazing the trail, a visor to keep the sun and debris out of your eyes, and a single-hand adjustable fit system—all of these perks come attached to an EPS foam frame with extra in-mold design to protect what matters most. Did we mention that it looks killer? Overall performance, extra comfort, and a stylish look all at a price half of what it should be gives Fox’s Flux model our nod as our favorite helmet. SAFETY: When you hit the trail, you want to be prepared for anything to happen. The Transition Hardshell protective helmet is outfitted with the best protection in the game, to keep you safe no matter what. The EPS core absorbs any hits or bumps, while the ABS exterior is sturdy and durable. Cpsc 1203, ASTM f1952, astm63:2008, en078:1997 approved. STYLE: Look cool, everywhere you go. The rounded silhouette is reminiscent of old school skate helmets, and the wide variety of colors and Fox branding give it a little bit of street cred. Riding around town or on the trail, you're sure to be the apple of everyone's eye. COMFORT: The last thing you want is to be on a ride, enjoying your day, when things start to get?uncomfortable. Lucky for you, Fox is on the case. The Transition Hardshell features 12 optimized vents to keep you cool, while the inner microfiber comfort liner prevents chafing. Plus, the comfort liner is removable and washable. USE: This helmet may look like your average skate helmet, but it can be used for so much more. Wear it everywhere- during leisurely park rides, long days dirt jumping, or even on hard, adrenaline filled trail rides; this helmet can stand up to whatever you throw at it. Life is short, go wild! What We Like: Swiss-Army flexibility, old-school skater vibe, extra protection with comfort in mind—and PRICE! Challenges: The extra protection sacrifices cooling. 12 vents still do the trick, but it might get warm. Tired of your teenager complaining that they have to wear a helmet? Not anymore. Taking cues from Tony Hawk and mixing them with the comfort and protection necessary for braving the mountain trail, this multi-sport helmet is great for beginners and kids who want that Fox cred when they are at the skatepark or cutting up the mountainside. 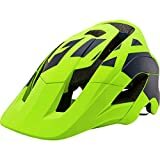 For the price of a dinner at a chain restaurant, you can get a helmet that shields your head from heavy impacts everywhere from a leisurely ride in the park to an adrenaline filled ride on the trail. Fit: Excellent. Varying foam inserts allow for unrivaled adaptability. Undeniable style, a new dimension of protection, a deep, well-vented visor—they all integrate stunningly to create a new standard in trail lids: the Fox Metah. Where so many other brands let you down, Fox continues to excel. Optimized venting to keep you cool, increased protection without compromise, a rear spoiler for your googles, and dynamic design with a deeper, more protective shell for hammering the toughest terrain—it’s all here. The 3-height adjustable system at the back is a lovely perk! If you’re looking for the ultimate helmet for the most challenging rides, then this is for you. The only reason it isn’t in the top spot is because it might be a little much for your average rider. That’s right: too many features! The price is well worth what you get, it’s just a question of whether you are ready to make the jump. There’s one word that sums this helmet up: aggressive. The extra vents for wicking sweat from your eyes on the trail, belligerent styling, burly padding at the back of the head—there’s not much to dislike. When you’re attacking difficult tracks, you’ll have peace of mind knowing the deep rear profile has you covered. The ratchet retention system provides a snug fit and the breakaway visor gives you maximum flexibility. The sides of the helmet may have to be adjusted if you plan on aggressive riding, but for aesthetic points and a design that matches your riding style, you can’t go wrong at about $70.